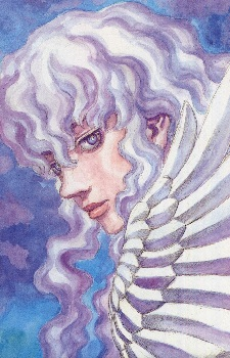 Griffith is the main antagonist of the series. He was the founder and leader of the mercenary unit known as the Band of the Hawk, named for his helmet which was forged in the shape of a Hawk's head. Extraordinarily charismatic, intelligent, and handsome, his skill with his sabre and tactics gives him and his band the reputation of invincibility, making him the favored choice of the Midland King, who was locked in a century long war with the Empire of Chuder. Believing that he is destined for greater things than the average man, Griffith is willing to sacrifice everything for the dream of his own kingdom and only values others so far as they are useful to him. The one exception seems to be Guts and Casca, both of whom he confides to in private moments. The source of his ambition is a Behelit given to him by a fortune teller she claimed was "The Egg of the King," which could lead an average person to becoming King himself.